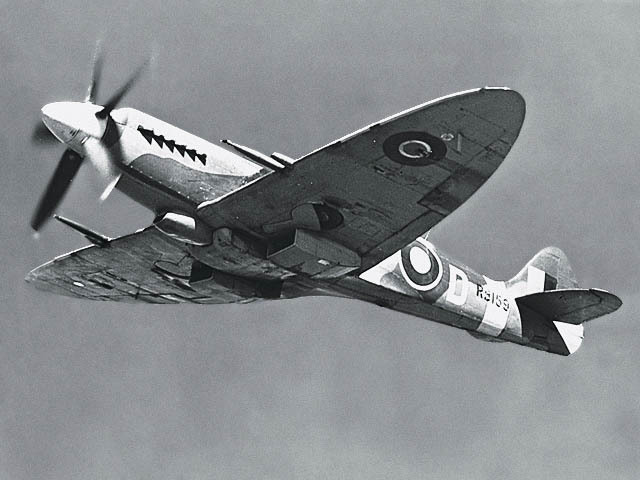 A beautiful photo of Spitfire Mk. XIV in flight, anno 1944. RB159 DW-D belonged to No. 610 Sqn “County of Chester” RAuxAF, the first unit operating this mark of the Spitfire. Delivered to the squadron on 1 January 1944, RB159 was part of the first batch of 50 Mk. XIV’s built. On 18 June 1944, shortly ofter D-Day, the Squadron was posted to West Malling, Kent, to operate against German V-1 flying bombs. It was about that thime that RB159 became a personal aircraft of unit’s CO Sqn/Ldr Richard Newbery. During subsequent operations Newbery downed eight V-1s and shared the destruction of two others. Later, RB159 served with Nos. 350, 41 and 416 Squadrons, finally being scrapped in 1949. Thanks for correcting this, I have updated the post accordingly. Squadron Leader Richard Newbury is my late Uncle! How proud am I!